The Aidar volunteer battalion has captured two Russian special operations officers in the anti-terrorist operation (ATO) zone in Donbas, eastern Ukraine. The information has been confirmed by Ukrainian presidential administration's spokesman for the ATO, Colonel Andriy Lysenko at a briefing in Kyiv on Sunday, an UNIAN correspondent reported. "As for the detention, it's true – the detention took place. Indeed, two Russian servicemen have been detained, and our investigators are now working with them. There is no other information," Lysenko said when confirming information that Aidar fighters had captured two officers of Russia's Main Intelligence Directorate, also known as GRU. Earlier, the fact of the detention was reported by civil volunteers. Doctor from Luhansk Grigory Maximets wrote on his Facebook page that Russian special operations forces deployed now in the militant-controlled city of Luhansk had attacked Ukrainian troops near the town of Schastia. 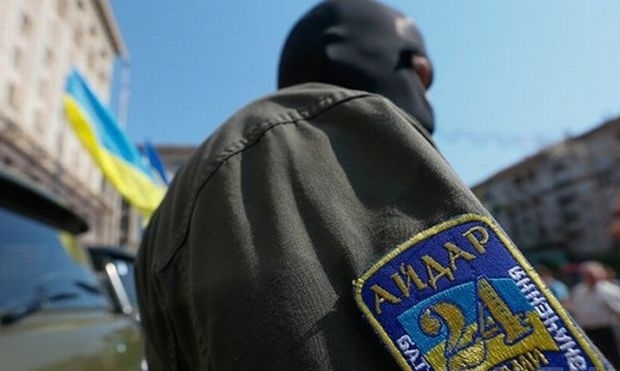 Two captive Russian officers from Samara [Oblast] (a military special forces unit from the city of Togliatti, Russia) were brought to Aidar's medical corps and hospital No. 59 on Saturday. He mentioned the names of the captive officers, they are Sasha Aleksandrov and Yevgeniy Yeroveyev. Posted by Григорий Максимец on 17 Май 2015 г.